The chicken would be great marinated the day before or when cooking on the BBQ would work well. If you don’t have asparagus green beans or broccoli would work well. Rub the chicken in olive oil and then chopped thyme and rosemary, season with sea salt. Colour the ½ chickens in a frying pan until golden all over, then finish by placing in a 160’ oven for 15 -18 minutes or until cooked all the way through. To make the sauce, reduce the sauvignon by half then add the chicken stock and reduce by half again, whisk in the diced butter then season with salt and add the chives. 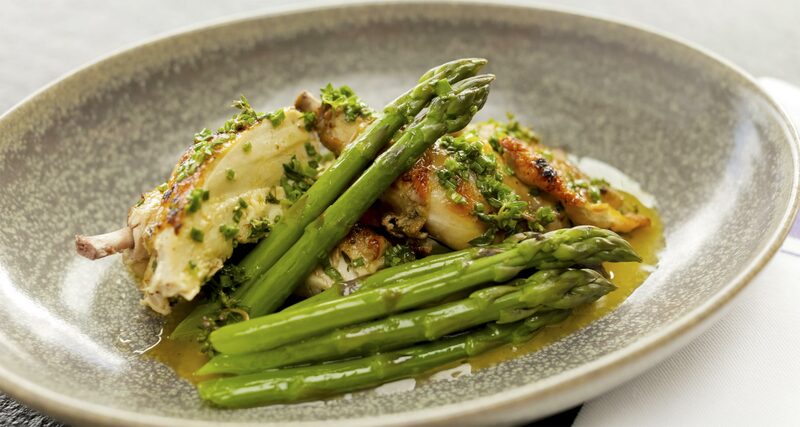 Carve the chicken and lay on the plate with asparagus, pour the sauce over the top.